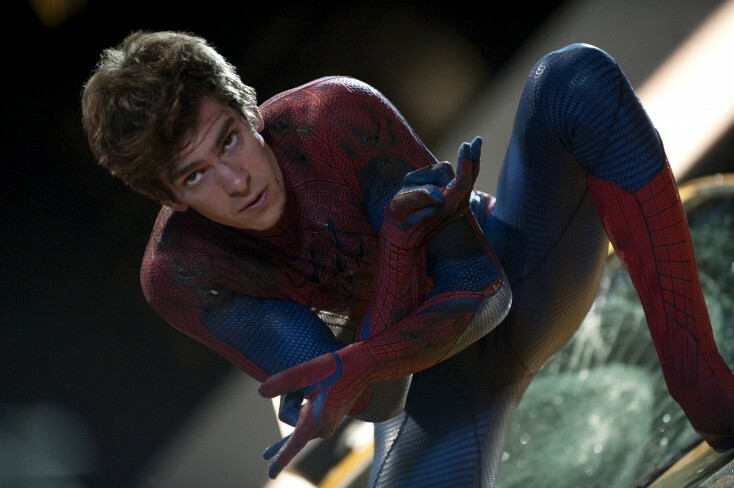 Andrew Garfield stars as Spider-Man in Columbia Pictures’ “The Amazing Spider-man.” ©Jaimie Trueblood/Columbia Pictures. Better in every way than the recent trilogy it reboots, “The Amazing Spider-Man” succeeds by boldly going forward into the comic-book character’s past. The epic-length 138-minute adventure not only updates the web-slinger’s origin but provides a glimpse of the parents who abandoned him when he was a child. At 28, Andrew Garfield (“The Social Network”) is at least 10 years too old for the part of teenage Peter Parker and his superhero alter ego. Fortunately, Garfield is a good enough actor to make the age discrepancy almost irrelevant. Sincere and likable but socially awkward and guilt-ridden, Spider-Man is the template for every Marvel Comics “hero with problems” who would come later. Garfield is convincingly confused, noble, joyous and sometimes soulful in the iconic role, without resorting to anything resembling irony or camp. That straightforward approach is one thing that sets “The Amazing Spider-Man” apart from “The Avengers,” this year’s other mega-budget Marvel movie. “The Avengers” existed in such a thrillingly heightened reality it was practically a winking parody of itself. “The Amazing Spider-Man” is a more real-world and personal story…even if it is about a guy who can climb walls and swing from webs. Brainy blond fellow student Gwen Stacy (Emma Stone) is attracted to Peter after seeing his attempt to stand up to school bully Flash Thompson (Chris Zylka). Stone dials back her usual too-perky persona, making Gwen more mature and centered than Peter. “The Amazing Spider-Man” restages the title character’s previously seen science-gone-wrong transformation, as well as the family-member murder that instigates his superhero career. The new versions of those scenes are an improvement over their counterparts in director Sam Raimi’s 2002 “Spider-Man.” Strangely, though, both movies alter a small but important aspect of Spidey’s comic-book beginnings in the same frustrating way. In legendary Marvel writer Stan Lee’s 1962 comic, a pre-crimefighting Peter Parker allows a thief to escape simply because he doesn’t think catching the bad guy is his responsibility. In both movies, however, Peter is given reasons to resent the robbery victim, making him unmotivated to pursue a thief who will end up changing his destiny. In other words, both screenplays make Peter something more akin to criminal accomplice than self-absorbed bystander. Another flaw “The Amazing Spider-Man” has in common with Raimi’s trilogy is that an awful lot of people end up seeing Spider-Man unmasked, violating a basic tenet of the superhero trade. Peter goes so far as to reveal his big secret to Gwen on their very first date here, which must set some kind of loose-lips record. Fanboys will spot endless other ways the film diverges from comic-book canon, but “The Amazing Spider-Man” gets much more right than wrong about the spirit of the character. The biggest back-to-basics improvement over the previous trilogy is that Spider-Man no longer is biologically altered to such an extent that he shoots webs from his actual wrists, which always seemed very creepy in Raimi’s films. In the new movie, Spider-Man uses mechanical web-shooters like the ones in the comic book, sometimes firing them off in sudden bursts like a quick-draw gunfighter. But his acrobatic movements are less fast-motion frantic than in Raimi’s trilogy, where fight scenes often blurred into incomprehensibility. Director Marc Webb (“(500) Days of Summer”) is better at staging everything from back-alley brawling to parkour-style running and jumping than Raimi was. Also, the way Spider-Man swings between skyscrapers on strands of webbing looks much more convincing than the less realistic CGI effects of the earlier trilogy. Rhys Ifans plays one-armed scientist Dr. Curt Connors, who is researching gene-splicing techniques that might regrow his missing limb. The same character (played by Dylan Baker) appeared in 2004’s “Spider-Man 2” and 2007’s “Spider-Man 3” without ever achieving his Jekyll-and-Hyde moment. But in “The Amazing Spider-Man,” his attempt to use himself as a test subject turns him into the monstrous human lizard who first appeared in the sixth issue of the Spider-Man comic nearly 50 years ago. Denis Leary is excellent as Gwen’s no-nonsense police captain father, a law-and-order type who doesn’t like the idea of even a well-intentioned masked vigilante. Sally Field and Martin Sheen are Peter’s good-hearted Aunt May and Uncle Ben, who raised Peter after his parents disappeared. Although Connors works for the OsCorp corporation, neither owner Norman Osborn nor his son Harry (who figured prominently in 2002’s “Spider-Man”) appear here. A stack of Daily Bugles is shown, but Peter is not yet working as a photographer for the newspaper, so publisher J. Jonah Jameson also is not in the cast. The climactic showdown between Spider-Man and the Lizard is appropriately action-packed, but thankfully not as beat-down sadistic as some scenes in Raimi’s trilogy. What’s even more refreshing is the way the new movie pulls off a great final-scene save after what looks like a soap-opera cop-out ending. Screenwriters James Vanderbilt, Alvin Sargent and Steve Kloves deserve credit for keeping things classic but subverting that major cliche. A bonus scene during the end credits sets the stage for a sequel that will have a lot to live up to. This wonderfully welcome remake is the best Spider-Man movie ever.